What sort of fingerprint is there on RR finger? 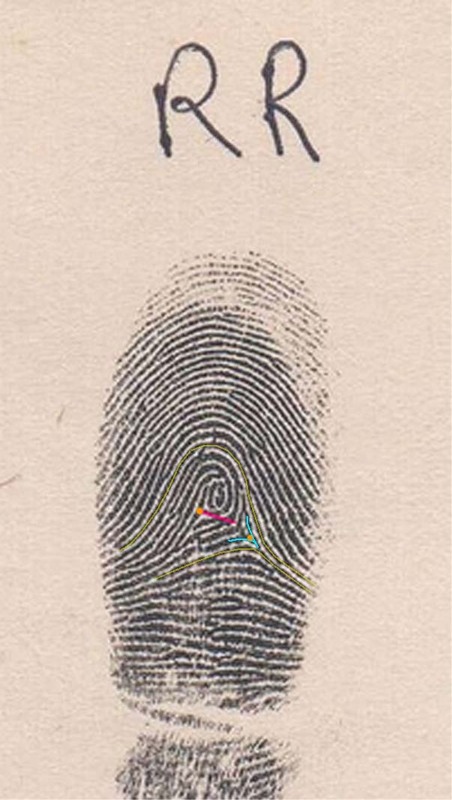 Can someone tell what sort of fingerprint is there on RR finger on the picture attached to the following link? My view is this is Peacock, but not sure because I learned that a peacock is a mixture of loops and whorl. Here loop is clearly seen but there I see no full whorl. One of my colleagues says this is a “Pregnant Loop” and not a peacock. Peacock ‘must’ have at least one circle in the ‘pregnant loop’ and that is not there. Can you see that circle and that is peacock uncommon? Thanks. Re: What sort of fingerprint is there on RR finger? Yes, the ring finger is featured with a (radial) peacock. The peacock requires being able to draw a line from delta to delta without cutting across or touching a circuiting ridge. There must be one ridge making a complete circuit. 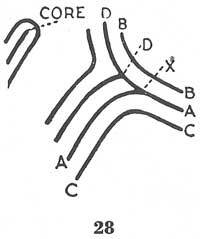 A whorl would have the line from delta to delta cutting through or touching the circuiting ridges. In this case, it is close, the line appears to almost touch the circuiting ridge. The touching or not touching of this line is the difference between it being a whorl or a peacock (central pocket loop) per FBI guidelines. I perceive the right delta to be located at a different location (below your pink line), and as a result the 'circuit' that you mentioned does not cross the imaginary line: I think the orange dots represent the deltas - see the picture below). Therefore I think this example can only be described as a 'peacock'. I'd agree it is a peacock by the rules I shared above. I have placed the delta on the right in the proper location. The type lines are not drawn until after the correct delta location is found. The delta is located at or out in front of the division of the innermost two parallel lines that divide. You must move in as close to the pattern as possible. Fig 28 in the FBI book is very similar. Note the delta is moved to location D and you have placed it further back than X in your sketch. Patti, we now appear to agree that Parender's example a peacock... so I think there is not much need to find further agreement regarding the details in Parender's example. PS. Regarding figure 28 in the FBI book: I see at least one significant difference, because the type lines a and b run parallel in figure 28. Again, not sure where you positioned your delta in Parender's picture exactly... but I think the lines closest to the right endpoint of your pink line do start in each other - and therefore I think those can not be the type lines, because type lines are required to start parallel to each other according the FBI book. But never mind, it doesn't really matter regarding the answer to Parender's question. Martijn (admin) wrote: Patti, we now appear to agree that Parender's example a peacock... so I think there is not much need to find further agreement regarding the details in Parender's example. Regarding in bold: Then you move to the next series of rules. Fig. 33 might help you there. It isn't always the obvious parallel ridges that become the type lines, it is the inner most parallel ridges that divide. Thanks for identifying and confirming a peacock pattern on RR fingertip. Thanks for your time and efforts. I think this is not common. You're welcome. It does seem like these prints that consist of a minimum amount of ridges to form a pattern are also borderline to being categorized in more than one type. Like this is just a fraction in space of being a whorl. It makes sense, since there is whole spectrum of prints between a 'pure' peacock and a 'pure' whorl and by collapsing on a definition we are missing the grey shades.